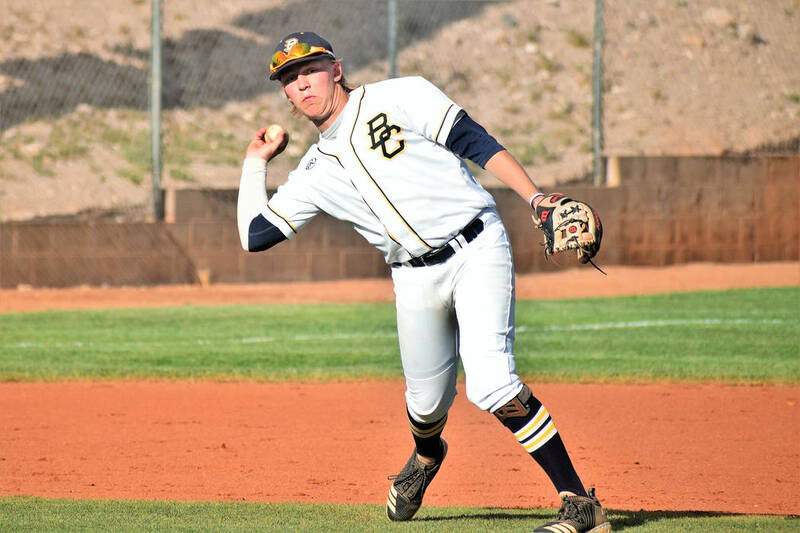 Boulder City High School boys baseball captured its first championship of the season, winning the 3A Sunrise League after defeating Southeast Career Technical Academy, Moapa Valley and Chaparral during their three-game slate. Robert Vendettoli/Boulder City Review Boulder City High School senior third baseman Rhett Armstrong scoops up a ground ball and throws the runner out at first in the Eagles' 14-2 victory against Southeast Career Technical Academy on April 25. Winning convincingly against Southeast Career Technical Academy on April 25, 14-2, and Chaparral on April 30, 14-2, the Eagles also got past their toughest challenge of the season against Moapa Valley on the road. Despite not playing their prettiest baseball of the season, the Eagles were able to squeak past the Pirates 4-1 after managing only three hits with four errors defensively. Rising to the top when they needed him, senior Chafton Temple finished the day 2-for-4 at the plate, coming through with a clutch two-run double in the top of the fourth inning to put the Eagles ahead for good 4-1. Senior D.J. Reese grabbed the Eagles’ other lone hit, finishing 1-for-3, while senior Teddy Lobkowicz provided the Eagles with a sacrifice RBI fly ball in the third inning. Senior Rhett Armstrong earned the win against the Pirates, throwing seven innings where he allowed one run on six hits with four strikeouts. Playing more soundly Monday against Chaparral, Temple and Reese were the heroes once again for the Eagles. Compiling 12 hits against the Cowboys, Temple (2-for-4) and Reese (1-for-3) each generated four RBIs, while Armstrong came through at the plate with a 3-for-3 performance, including a double and triple. Junior Jimmy Dunagan finished 2-for-2 with an RBI double as well, while freshman Joey Giunta earned the win, throwing five innings where he allowed two runs on five hits with three strikeouts. Against Southeast Career Technical Academy, the Eagles needed only six hits to score 14 runs, powered by Temple (2-for-3, three RBIs), Reese (1-for-2, two RBIs) and senior Nolan Herr, who had two sacrifice RBIs. Coming into his own as a pitcher, Giunta also earned the win against the Roadrunners, throwing four innings where he allowed no runs on two hits with four strikeouts. Results from Wednesday’s senior night against Del Sol will appear in next week’s issue.